All that I remember about the day I arrived on campus nineteen years ago this August was that it was hot and that I was not looking forward to two-a-days. Like pretty much every incoming freshmen at pretty much every school, I’m sure I was a volatile mix of anticipation, fear, excitement and a few dozen other emotions endemic to teenagers. But mostly what I remember was that it was hot. One thing I’m sure of, however, is that there was no note waiting for me from my future self. It’s not clear to me even now that I would have been any more willing to listen to an older version of myself than I was, say, my parents. All part of being a teenager, for better or mostly for worse. It couldn’t have hurt, however. Because shortly after my arrival in the Purple Valley, I pancaked. Nothing in my brief history up to that point had prepared me for my performance, which bore an unfortunate resemblance to a slow-moving car crash. I failed. Repeatedly. I turned things around academically midway through my sophomore year, but my GPA never really recovered from the beating it took the year before. Not that that has mattered much, professionally, but like most Williams students, I’m competitive, and I wish that my performance had more accurately reflected my abilities, rather than the lessons I had yet to learn. Lessons that my future self could have passed on to me, were such things possible. In lieu of that, I offer you new people the following with no warranty whatsoever. These are just a few of the things I wish someone had told me, so I feel obligated to tell you now. And as my good friend Sean Bowler ’98, who was taken from us all far too early, did for his students when he said farewell at Salisbury, I will try and keep it short. And I will fail at that too. You are not wrong. If you play sports or go there to watch them, you will think this at some point. Whatever they may teach you at Williams about climate change and meteorology, Cole Field is likely to be, at any given point in time, the coldest place on earth. Prepare all you want; there’s nothing you can do about it. We tried everything, from long underwear to those awful, burning chemical heating packets, and we still froze. As you will. I just wanted you to remember that I told you so. This one was easy for me, because I was never King of the Hill in the classroom or on the field of play. It was quite obviously an adjustment for a few of my classmates, however. Accustomed to being the big fish in the small ponds they hailed from, it was jarring for some of them to be second best, or just as often, third or fourth. But that’s what going to a place like Williams is all about, because at least in that one aspect, the campus is exactly like the real world. With the exception of a very small number of us, there’s always going to be someone who’s smarter than you. Or a better athlete. Or both. Where you can’t change this through hard work, you need to acknowledge the situation and then find ways to compete. Because that’s life. The playing field isn’t always going to be even. Or fair. But neither do the best always win. Show some adaptability. Looking back, it’s almost shocking that I recovered as much as I did academically, given how horrifying my grades were that first year. And, it must be said, my first semester as a sophomore. But while I accept full responsibility for getting myself into that mess, the credit for my recovery belongs entirely to someone else. Part of it was reducing my athletic workload – and the related social calendar – from one sport to two, part of it was a few fairly significant changes in my social life, but the man who more or less singlehandedly salvaged my Williams tenure was Professor Thomas Kohut. It’s not easy to pick a major when you’re barely holding your head above water in all subjects: how can you ask a professor to be your advisor, when you both know you’re failing? And it’s even harder when your professors look on you with a mixture of disdain and disappointment. Not that I blame those who did: I deserved their scorn. Fortunately for me, however, there was one exception. Professor Kohut, perhaps out of pity, earned my trust by relating some of his own struggles. Better, he threw me the rope I desperately needed, agreeing to serve as my advisor. With that came an honest and frank appraisal of where I was failing, and what I needed to correct. Coming from someone who spoke to me as an adult, rather than at me or worse, down to me, it was fine. His opinion, one subsequently confirmed, was that I needed smaller, more interactive classes to hold my interest. The difficulty of the material was not, for the most part, my problem; it was rather my engagement with same. Professor Kohut’s recommendation – order would not be too much of an exaggeration, I think – was simple: I was to take smaller classes on subjects that held some interest for me with professors that would care whether or not I was in class. Here was a talented professor who knew I’d missed skipped a few of his classes, and yet had no intention of condemning me for it. Instead of writing me off as a lost cause, he took the time to sit and speak with me about his own experiences, and how he thought that I might improve. It may well have been the first time in my academic career that someone treated me as an adult, but in any event it made a difference. So what I would tell you, Future Williams Graduate, class of ####, is this: do not write yourself off. If you got in, you can do the work. You may think, at times, that you’re an idiot, but the folks that run admissions are most certainly not. What you need is to understand that we all make mistakes. What’s far more important is how we recover from them. Seek out the professors that understand this and genuinely care – Kohut and Shanti Singham were the two that I had the most respect for and success with, but there were dozens – and stick to them like glue. No, I have no idea why Williams has a swim test. Yes, you have to pass it. One of the worst things to happen to me at Williams was the first test I passed there, the Quantitative Skills Assessment. By passing it shortly after arriving I was obligated to take exactly zero math courses. Which I promptly did. In retrospect, this was a mistake. This isn’t about Fivethirtyeight.com or Freakonomics. Or at least, not entirely. You may never face that time your elementary school teachers warned you about, where the ability to save the quadratic equation is a life or death affair. But it’s a safe bet that whatever your chosen occupation – entrepreneur, author, real estate agent, chef, artist, teacher, and, yes, I-banker – the ability to do math is going to be of benefit. Are you going to become Nate Silver, and jump from an economics and accounting background into a career as a baseball statistican, parlaying that into a role as a nationally recognized political observer? Seems unlikely. But would it be useful to know how to use numbers to make better decisions, whether you decide to run a brewery, a healthcare non-profit or the marketing department for a Fortune 50 organization? Yes. Businesses – most all of them, today – are increasingly about numbers. Whether you think this is a positive or negative development doesn’t, I’m sorry to say, matter much. They’ll go on without you. The fact is that industries that functioned for years on intuition and tradition are increasingly run algorithmically: baseball’s Exhibit A in that department. This means that math – and its first cousins statistics and economics – should be staples of your Williams education. I took neither, largely because I had no idea they’d be so important later, and I’m still paying the price. There’s a reason I’ve had to subsequently take a statistics course at Harvard, and that reason is that I was dumb. Unless things have changed radically at Williams, virtually no one will tell you this. This is not to say, please note, that there’s anything wrong with either profession. I myself was a consultant, and my brother – a Bowdoin grad – was an investment banker, and we’ve done all right. Both professions are, if nothing else, excellent training for jobs that you’ll have later in life, as they can teach you quite a bit about how businesses are run and how they can fail. But it’s equally important to understand that if you don’t interview with one of the firms coming to interview, there are a host of things you can do with yourself. Which, obviously, I can’t cover here. But look around, and think not just about what you think you should do, but what you want to do. I understand that they’ve outlawed Beer Pong on campus. This is sad, because a better drinking game has yet to be invented. There was a time when the Slippery B – if it’s even still called that – was the Beer Pong capital of this country. It’s depressing that those days are behind us, and that that elegant game from a more civilized age has faded from the average student’s memory. Later, when you consider going to business school, and I’d wager that a lot of you will entertain the notion eventually, one of the Pro’s you write down to weigh the decision will be “networking.” Which is legitimate. Of the friends and former classmates that I know who’ve gone for their MBAs, networking has been at least 50% of the reasoning for shelling out the money and losing the years. 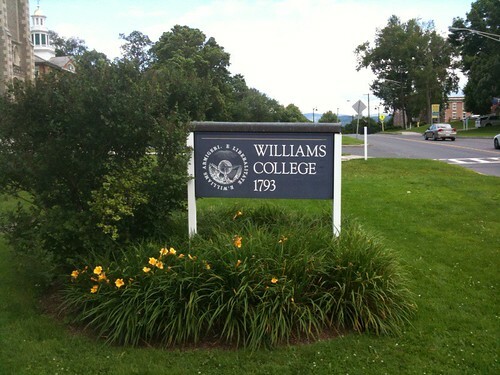 The same principle, though you may not realize it at the time, applies to your Williams education. Maybe you don’t meet the next Mark Zuckerberg, or, in our case, the next Bo Peabody, but given that you’re going to be on campus for four years with some aggressively bright and talented people, you might want to meet a few. Or at least remember who they are, so when you read about them later, you can comment knowledgeably. I’ll be the first to admit that as a history major, I should have adopted Euripides‘ mantra – “question everything” – far sooner than I did. Which was just a few years ago. Nevertheless, you now have the opportunity – as a young freshman – to grasp this important lesson at a much more profitable age than I. One of the things you learn as you go along, you see, is that everyone is wrong all the time. We jump to the wrong conclusions, we misread the available data, and sometimes we just guess incorrectly. But when you’re younger, it’s natural to assume that at least the folks older than you – your parents, your professors, even the seniors – have it together. They don’t. Sometimes, of course, you just need to go with the program. Socrates questioned everything, and ended up dining on a hemlock milkshake. But where it’s practicable – and particularly where conventional wisdom is concerned – do not forget to employ your critical thinking. Too many of us do these days; just watch the news. Someone wants to teach you how to knit, guys? Learn. I’m not joking. You never know when the ability to knit will come in handy; a good friend of mine was wooed, at least in part, by a knit hat from her now boyfriend. Pick up anything and everything you can. Parkour. Frisbee. Guitar. Japanese. Whatever. You’re going to be around people who know a great many things you don’t, and even if you don’t master them, you never know when the exposure will be useful later in life. More to the point, unless you retire early, you’re not likely to have another period in your life where your primary mission in life is to learn. Later, you’ll be distracted by reunions, work, a family, and a few thousand weddings. Even if you don’t think you know that many people. The good ones, anyway. Mine are now lost to history, unless they turn up when my parents move. This is not exactly a major loss for posterity, but there are those that I’d like to have back, if only to reflect on how, even then, I could never use one word when I could use five. When else in your life, after all, are you going to be able to take a course on “Auto Mechanics?” And have it be the only course you’re responsible for? Exactly. Winter study is what school should be. With the exception of the one year a classmate and I spent freezing to death behind the Clark Art Museum hunting for non-existent turkeys, winter study was uniformly outstanding. The administration probably isn’t going to put me in the Alumni Review for saying this, but this is for you, freshpeople, not them, so remember: there is more to life than class. No, you shouldn’t cut all your classes. Or even some of your classes. Take advantage of the education, because it’s the best you will ever get. And it’s the last undergrad experience you’ll have. But that undergrad experience should include time with your friends, your boyfriends and girlfriends, and your teammates. Because that, too, shall pass. I remember playing home run derby down on the women’s softball field with my best friend on a beautiful spring day my senior year as much as I remember any class I ever took. And there were some memorable ones, believe me. Life is short. You’re going to hear that a few thousand times, and at this point in your life that phrase will have effectively no meaning. That’s fine. If you can tentatively accept it as true, however, it’ll make some of your more important decisions easier. Many of you will embark on careers that will make you miserable because of the hours, the content, or both. And there’s nothing wrong with that for a few years; paying your dues is part of the process in many industries. But if you’re still miserable years later, remember what you’ve been told: life is short. Do you want to spend it doing work you hate, or would you prefer to work on something that you like or, if you’re lucky, love? The organic route: as you become more eminent, gradually to increase the parts of your job that you like at the expense of those you don’t. The two-job route: to work at things you don’t like to get money to work on things you do. Which one of those works for you will – assuming that the idea of doing something you love appeals to you – will depend on your passion and your priorities. Being a starving artist sounds romantic until you’re actually starving. Eventually, however, you will get to a point in your life where you’ll look back on what you’ve accomplished and reflect. If you’ve been punching the clock for ten years, that’s not going to be a fun conversation, so work on things that matter. I know. Every alum says this. But that, by itself, should tell you something. Enjoy Williams, because like life, you only get one crack at it. Back in April, I wrote about our decision to update our antiquated home media setup with a Roku box and Plex software, among other pieces. The motivation was simple. As non-cable subscribers, we were looking to bring our multimedia setup into the 21st century. And with Plex specifically, we wanted to hedge against the varying variability of NetFlix titles as well as our own problematic bandwidth (the downside of living on an island). Thus, sogflix – our local NetFlix equivalent – was born. After seeing it in action, a few people have asked how it’s done. So here’s what you need to know to duplicate it in your own home. All Amazon links are affiliate links, FYI. Here’s what I’d use to make it all work. Note that this list was updated in January 2018 to account for discontinued hardware and cheaper, larger capacity drives. The first step in building a digital library is, of course, digitizing the library. This is the most tedious and time consuming part of the process, depending on the hardware you have available. My workstation will convert a movie in about twenty minutes; my Thinkpad takes closer to two hours. It’s fairly easy to run as a background process, however, converting media while you work on more interesting subjects. Make sure the framerate and video quality are set to constant, and set the latter to 17. The output from this will be movies of somewhere between 1 to 3 GB per, depending on length. Just as an MP3 is a lossy copy of the original, the quality is almost certainly a compromise. I’m not able to tell the digital copy from the original DVD, however, so that seems sufficient. Initially, I was content to use the analog audio/visual patch cable from the Roku to the TV. This is a workable solution if your TV is not HDMI capable. Upgrading to an HDMI cable, however, at a cost of $2.50 from Monoprice yielded immediate improvements in both formatting (menus fit the screen perfectly) and video quality (Plex movies were substantially improved). If you have a pure 802.11n networking setup, you may be able to avoid hardwiring. In my case, my Mac Mini was old enough that its networking was 802.11g which proved to be insufficient, causing local movies to buffer as if they were being streamed. The solution in my case was connecting both the Mac Mini and the Roku physically to the access point (which in my case is actually the fourth in a chain of dd-wrt formatted WRT-310N Linksys routers). Once connected by ethernet cable, video loaded in a few seconds and required no buffering. For non-technical users, set up of the Synology unit may be moderately challenging, but it’s manageable. Those reasonably familiar with storage should have no difficulty, with that the caveat that install media is packaged for Mac and Windows only. Install the hard drives into the chassis as intructed – you’ll need a screwdriver – and then follow the instructions on the software to install the base image on to the Synology, and format the drives. Once set up is complete, create separate directories for Movies and TV. I do not recommend music if you have a large collection (> 10K tracks). Plex struggled to add metadata for my music and performance suffered. With movies converted and the storage media prepared, copy the remaining movies to the media using the fastest mechanism possible. The DS212 supports USB 3.0, notably. Movies can all be located in the same directory. For TV, you’ll need to use a [Show Title] [Season #] directory structure, where  designates a directory. Install the Plex Media Server, available for download here for Linux, Mac and Windows. Once installed, run Plex and select the Media Manger. Within the Media Manager UI, create Movie and TV sections within Plex, pointing the sections at the directories you just created and populated with media. Before you click update to add metadata, you need to make one adjustment. To avoid Plex retrieving foreign movie posters for you media, click the “Metadata Agent Settings” at the top of the Plex Media Manager, then click “Freebase” under Movies. Drag MoviePosterDB to the top, then TheMovieDB behind it. Finally, click “Edit Section” at the bottom of the Media Manager and select “Freebase” as your primary metadata agent. Then click update and Plex will retrieve a wealth of metadata – movie posters, actors, directors, genre, descriptions and more – for your video. Assuming it’s in one of the databases, of course. Within Roku, add the Plex Channel. If your Plex Media server is running and on the same network as the Roku, it should autodiscover your server and you’re done: Plex Media will now be playable through your Roku. Enjoy! You now have your own personal Netflix.